A few things I have whipped up for some of the youngen’s. This is a onesie for a little boy in the family. I used this tutorial to make it. This is a horse for my cousin. 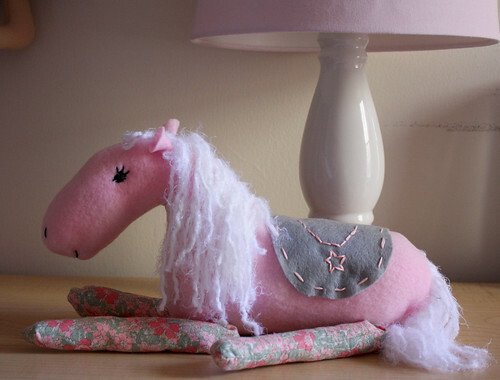 Last year I asked her what she wanted me to make her and she said a horse. So, I completely winged it and this is what it came out as. I like the whimsical look. My daughter says she wants a purple one, so we’ll see if I can make her one too. And last, this is actually a baby shower gift. I used one of those quilt packs from JoAnn’s to make it. Really quick and cute. I love the feel of the different fabrics! I love the onesie! I need to make some baby gifts, so I think I’ll try making some! I love the horse, it is adorable! My granddaughter loves horses! Do you have a pattern for it??? 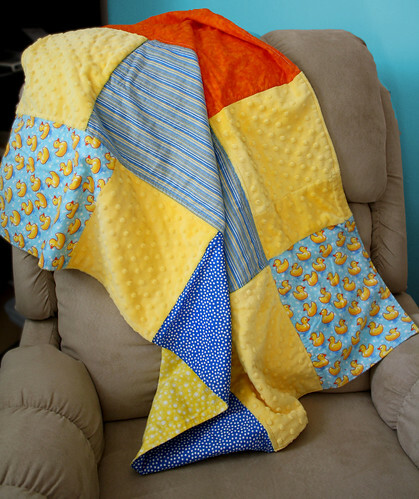 I love the quilt too, I didn’t know JoAnn’s had kits for those! I’m going to have to go get one! Thanks for sharing your good ideas! Stop by my blog sometime! All adorable stuff! I also love the whimsical look of the horse. i.want.that.HORSE!!!!!! so does my 4 yr old. 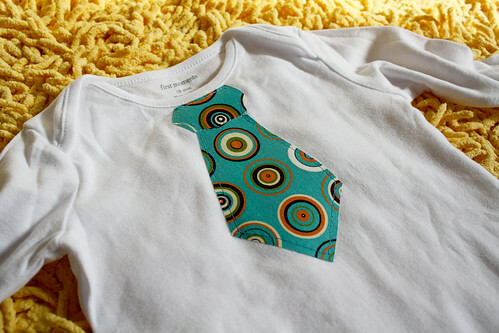 Super cute little shirt with a tie! I wish one of my little boys were “little” enough to fit in those cute baby shirts again! That horse is quite a darling! That horse is adorable! very whimsical, I LOVE it! I love every. single. thing. you showed in your post today! Having a hard time picking my favourite! On the other hand – my daughter fell head over heels in love with the horse. Now she’s begging me to make her one. Will you post a pattern? Pretty please?? With a cherry on top? Oh get out of here-that horse is so cute!! I can’t believe you winged that. Amazing. I love that horse!! What a great gift – those are the ones that get remembered, not the latest and greatest Tickle Me Elmos!! I love the onesie! how cuutee! All I seem to want to make this year are baby/kids gifts.. I need more kids in my family! I love how much the stitching shows up on the tie! Too cute! Is it just regular thread? I’m guessing you used fusible web to attach the material to the onsie or was is wonder-under or are those the same thing?!? I may just have to make one on a t-shirt for my 2-year-old. It’s so nice to see an idea for a little boy (not that your little girls things aren’t ADORABLE, they are!!!). 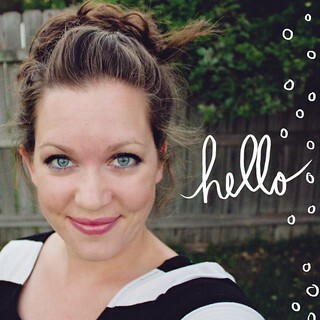 i just have to say, you are adorable, and i love your blog! i don’t even remember how i came across it (possibly one pretty thing), but i’m so glad i did! i just recently made a TON of your flower fabric earrings for my sisters and close friends for a little xmas gifts and i can’t tell you how much they LOVED them. i gave a pair to my good friend and hair stylist and she just flipped out how cute they are and put them on right away. And the whole time she did my hair she kept looking at herself in the mirror admiring the earrings and telling me how much she loved them! i can’t wait to see the reaction of my sisters on xmas. they are going to love them! thank you for sharing the tutorial on those earrings and everything else you share! my blog is so not even as awesome as yours so if you don’t “stop by” i will so not be offended! i want a blue horse. that is so adorable! tutorial please! thanks for linking! your blog is too fun! Pattern is in the works, hopefully I will post it this week. Yes, I just used regular thread. You could hand embroider it for a cool look too. And yes I used the fusible web stuff (it’s the same thing, I just think Wonder-Under might be the company name? ).